Imagine this printed on leather. Is that a weird question? I mean, after all, it says, “vegan” on it. Of course it’s vegan. It’s right there in the phrase. Yup, I get it. Except I’m not talking about the message printed on the shirt. I’m asking what’s behind the printing of that shirt. Before we get into some answers, let’s think about a situation we can all relate to. How do you feel about that? Kind of… annoyed? Frustrated? That’s often how Jenni and I feel when we see someone selling t-shirts plastered with a catchy vegan phrase and ask, “Is your printer vegan? Do they use vegan inks or sustainable methods?” and we’re met with blank stares – or worse, total apathy. Annoyed. Frustrated. Somewhere a unicorn just died. Even as we clench our fists and mourn mythical creatures, we’d much rather educate than berate. Better results, ya know? Besides, we’re not perfect. We do our best. Caring is numero uno. Hopefully, you’re one of those vegans who really does care about more than how much cash they can make in the vegan marketplace. As plant-based eaters, I believe we’re also default environmentalists. If we’re going to put our message out there for the world to wear, we should at least try to move in the right direction. For you, Caring Vegan, I’ve jotted down some information that will help prepare you for your next run of vegan tees. Read on! We can clear our consciences right off the bat with this little nugget. In silk screening, also known as screen printing, a mesh screen is used as a stencil to push the ink through. A long time ago, in a galaxy far, far away, the screens were made of silk. As you might have already guessed, silk is not vegan. Oh no! What to do? You can chill on this one. The good news is that, these days, screens are made from nylon, not silk. The term silk screening is still used, because, well, we’re used to it. Also, nylon screening doesn’t sound as artsy-fartsy. Now that we know the worms can relax, let’s move onto inks. Are they vegan? Are they safe? Are Screen Printing Inks Vegan? Now and then, we get this question from some of our lovely customers. I wish more people would ask (or care). In fact, one of our customers spent time calling around Los Angeles with that question, only to be disappointed by printers who either couldn’t or wouldn’t answer. Sound crazy? We thought so. Thankfully, there’s a simple method we use to find out if the ink we want to use is made with animal products or tested on animals. You ready for this? We call the manufacturer. Mmm-hmm. Yup. That’s it. Even better, we get answers. Sometimes we have to wait on hold while they find their chemical engineer, or we have to rephrase the question. A lot of people don’t immediately understand what “vegan” would mean, so we educate them and ask more specifically about whether or not the ink contains any part of an animal. We’ve always received informative, respectful answers. It’s just that simple. So if you ask your printer if they use vegan ink, they may not know what you mean. Hey, that’s okay, this is your opportunity to educate them. If you explain nicely, rephrase your question and they give you flack (or don’t know), consider going elsewhere. So you’re at your local vegan fest, festing it up with your jackfruit tacos and all the Soy Dream you can handle, and you find yourself at a vegan apparel booth. Wow, those are some sick vegan tees. So soft, and you can’t even feel the print. You just gotta have one! Hold up there. Before you plunk down your vegan cash, let’s talk about how those t-shirts are printed. To get a really soft hand like that, screen printers use either water-based ink (we’ll get to that in a minute), or possibly a method called discharge printing. Essentially what a discharge print does is bleach the dye out of the shirt, then a water-based ink is applied for color. What’s the problem? Discharge inks are highly toxic. There’s formaldehyde and a whole cocktail of other chemicals that you’re not supposed to breathe while printing (or ever). Why should you care about what some screen printer is breathing? Well, that bleaching cocktail at some point not only vaporizes into the air, some of it gets washed down the drain. Where does it go? Some of it gets filtered and sent back to you as tap water. Some it goes out to the ocean, unfiltered. Some of those animals that you fight so hard to protect live there, remember? The dye from the shirt is still released somewhere. Where did it go? What constitutes a “natural” enzyme? Where do they come from? Animal source? Do you know? If we’re going to demand that people not use animal products, we should demand to know how that vintage-feel t-shirt is made. It affects both our environment and the animals. Water-based printing is great. It looks good, it feels good on the shirt, it even sounds really environmental. After all it has water in it! That must be awesome! The assumption is that, unlike plastisol-based printing, it’s the best thing for the environment. Why, just take a sip of this water-based ink, it’s delicious. *disclaimer: don’t do that. Before you drink the water-based kool-aid, read about the myths of water-based inks. Then come back here. So now you understand that water-based ink is not just water and harmless color made from unicorn breath, it’s actually made with solvents and other chemicals. Not that plastisol ink is chemical-free, but the cleaning methods are very different (and the way we do it, sustainable). Water-based printing can be done sustainably, so knowing how things should be done will help you choose wisely. As you can see, no t-shirt printing method is 100% perfect for the environment. It’s about making an educated, conscious choice. You can’t please everyone, but having solid answers for your customers is a pretty big deal. If you care about the environment and the animals, it’s worth asking your screen printer about their methods. If they can’t (or won’t) answer your questions, it’s the same as a waiter not telling you if your meal is vegan or not. You wouldn’t accept that, so why accept anything less than vegan and environmentally-friendly screen printing? More questions? Ask in the comments or email us! 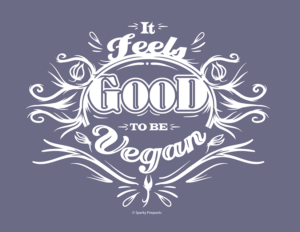 3 Responses to Hey, is that vegan t-shirt… vegan? Great article. It was very informative so thanks!!! Really love this article. The exact questions going through my head when I decided to focus my brand on Veganism. I have to ask my screen printing guy what the inks are before I give him any more orders. Thanks for this article!